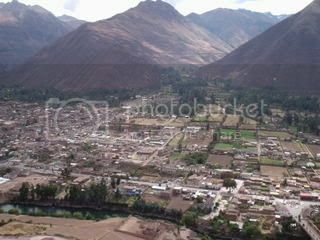 I thought I would share some pictures of my son, Jeremy's, mission trip to Peru last week. Everything went well, no luggage was lost, they made every connecting flight and no one was hurt. 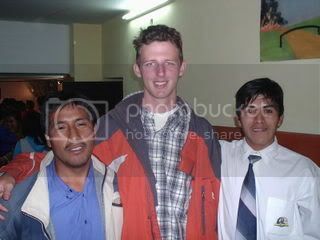 Jeremy was in the group whose destination was Cusco, Peru. Elevation 11,500 feet. I was mostly worried about his asthmas being at the high altitude, but no problems. 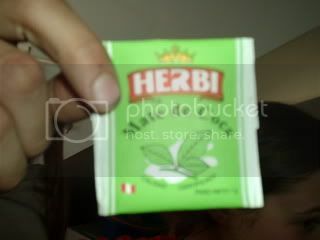 Jeremy did say that they have a type of tea to help with altitude sickness. Made from the Cocoa plant, which by the way is the same plant that cocaine comes from. The tea does not give a person any kind of high, but everyone was told that if they were tested for drugs, it would show up positive for cocaine. 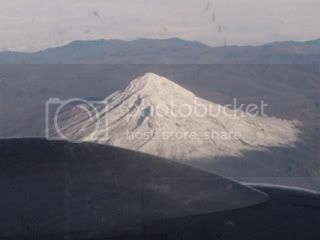 Here are some pictures of the beautiful scenery. 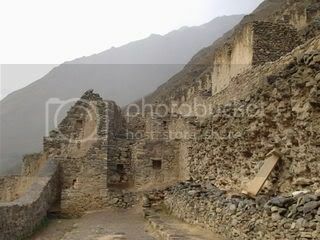 The group was able spend one day visiting some Inca Ruins. Jeremy thought it would be funny to take a picture that would give his mom a heart attack!! 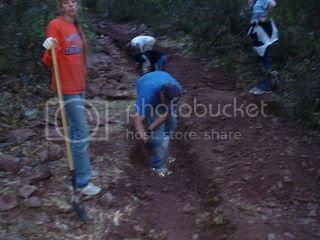 One afternoon was spent digging a ditch for new water lines. He made friends with two of the boys at the seminary. They thought he was really tall....Jeremy thought they were really short. 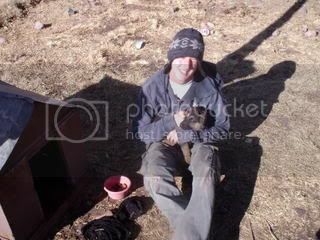 He also made friends with the local puppies. Their last full day was spent in Lima. 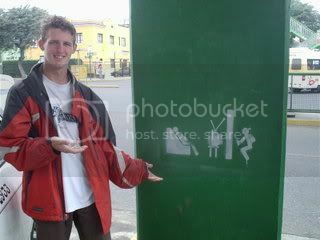 When touring around, the group found a sign that they still have not figured out what it means. It was out on the street with no television in sight. I believe Jeremy's life was changed by this trip. He is a 16 year old with a big heart and a proud mom. I told you your son would come home a different person. I think I said he would come home a man rather than a boy. I am pleased to hear he had a good time and things went well for him in his travels. That sign is crazy. What is that other person doing? Is that a backpack or some kind of flying pack as it looks like he/she is ready to fly through the air? Jackie...I thought it looked like a bandit with something over his face. Wow, what an adventure for a 16 year old, he is a lucky young man! He's got a great mom too, allowing him to undertake such a huge challenge, kudos to you mom (though you probably shouldn't look at that scary picture too much or you won't let him go again, haha). Thanks for the pics, lovely! And, er, yeah...what is that graffiti about??? cancuncanuck...I told him that if I would have been with him when he took that picture I would have "grounded" him. He said that the walkway wall was right behind his back. 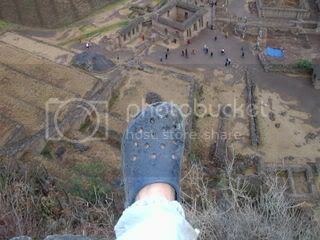 I am very surprised they let the tourists get that close to the edge of a cliff!! Carl...I was wondering if they had tried to bring any of the tea home on the plane if the drug dogs would have smelled it out as cocaine. What a wonderful experience for him! And great photos! That is one crazy sign...would love to know what it means. 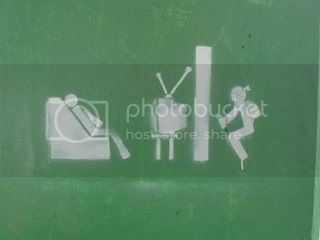 Deb...I think we finally figured out what the sign means. The person watching TV= Watch. The robber=robbers or pick pockets. Watch out for pick pockets!! We were all eating supper last night and our oldest son, Josh, said it was like pictionary. The area is well known for pick pockets.